2019 National Elections - Which Parties Are Fighting for Your Vote? 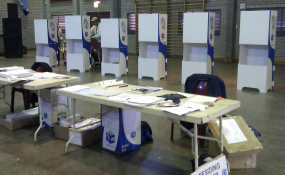 The IEC announced that a record 48 political parties have successfully registered to contest the 2019 general elections. Most have been formed recently, suggesting that many see an opportunity to capitalise on voter uncertainty after the Zuma years. Noteworthy, too, is the number of religious parties -- with churches hoping to turn congregant numbers into political power. In the first of a two-part series, we take a brief look at the parties appearing on the ballot sheet in May. Launched in 1993, one of the ACDP's unique claims to fame is that it was the only party to reject the South African Constitution -- on the basis that it enshrined the right to abortion. Supports a return to "biblical principles", including the imposition of the death penalty. Led by Dr Kenneth Meshoe, the ACDP received just over 104,000 votes nationally in the 2014 elections, giving it three seats in the National Assembly. No information is available. Confusingly, there is a Namibian opposition party of the same name; and the South African Congress of Democrats was an anti-apartheid organisation run by radical white lefties.